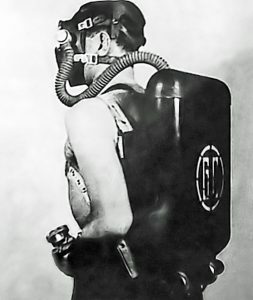 In 1937, Georges Commeinhes son of René adapted the breathing apparatus from his father for underwater uses. It was in the form of a two-cylinder open-circuit and had a demand valve regulator hooked to a full face mask. 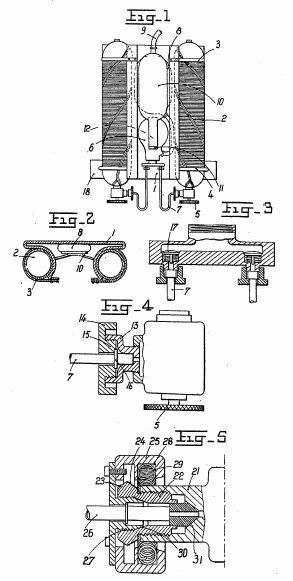 The demand regulator patented in 1939 was located in a rectangular box between the two cylinders. Georges dive with his GC-42 for Georges Commeinhes year 1942, to a depth of 53 meters in the Mediterranean near Marseilles. Shortly after this demonstration, the apparatus production started with most to supply the French Navy. After joining the Allied Forces after they landed in Normandy, Georges Commeinhes got killed by a sniper in 1944 in the north of France. This put an end to further efforts to develop further the CG-47, which was the last model produced.